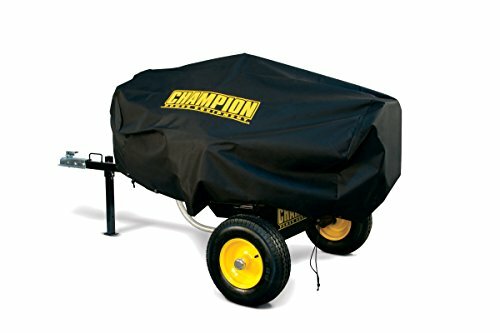 The Champion Power Equipment 90054 Weather-Resistant Storage Cover is designed to fit your 15 to 27-Ton Champion Log Splitter to keep it safe, clean and dry so it’s ready to get to work when you are. Once the cover is on your log splitter, simply pull the adjustable drawstring to ensure the bottom edge of the cover provides a tight fit around the log catchers, beam and engine. Champion’s versatile cover provides a secure fit for log splitters with and without log catchers. Featuring a tough, water-resistant polyester exterior, this storage cover will keep your log splitter and its engine protected from sun and UV damage, rain, snow, dirt, debris, dust, cobwebs, birds and more. Protect your valuable Champion log splitter year round with Champions’ selection of small and large log splitter covers. Buy with confidence – Champion will back up your purchase with a 1-year limited warranty. If you have any questions about this product by Champion Power Equipment, contact us by completing and submitting the form below. If you are looking for a specif part number, please include it with your message.